WaveBrake technology reduces splashing up to 40% for a safer environment, cleaner floors, and more efficient mopping. Made from structural web-molded plastic and premium tubular steel. Bucket has graduated measuring marks. Accepts optional 9C74 Dirty Water Bucket. 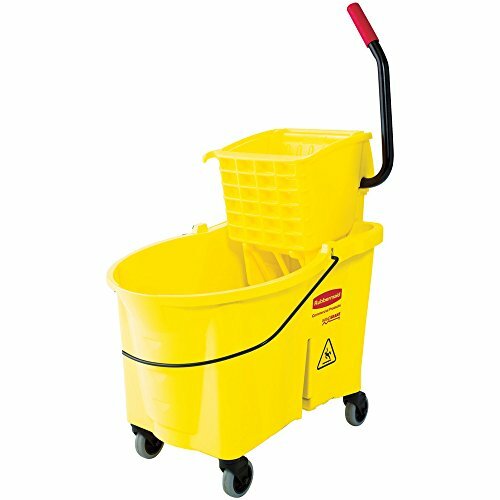 Wrings mops with 18% less effort, and is rigorously tested to exceed 50,000 wringing cycles, more than 58 times longer than comparable wringers. Innovative foot pedal drain lets you empty the bucket easily with no lifting. Connects with Lock ‘N Go System to Rubbermaid Cleaning Carts. Color-coded for zoned cleaning systems. Helps earn Leadership in Energy and Environmental Design (LEED) credits. Made in the USA.